On this coming Thursday we will remember the patron of our parish, St. Michael the Archangel. He shares his feast day with two other archangels: St. Raphael and St. Gabriel. His name, translated from the Hebrew, means “Who is like God.” He is credited in the Book of Daniel (10:13) with defending God’s people. The Book of Revelation (12:7) tells us that war broke out with Satan revolting against God. St. Michael prevailed over him and cast him from heaven. The devil still tries to war against heaven by doing what he can to tempt people to commit evil. He and his pinions want to extinguish the life of God in our souls so that we will be lost. He can never make us sin; but he can use all means of trickery and deceit to get us to cooperate with his nefarious plans. We have to say “yes” to him and “no” to God of our own free will. We wouldn’t stand a chance if it were not for the help of God. 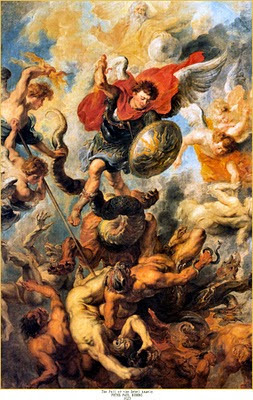 St. Michael would not have defeated Satan if God had not asked him to fight and had not given him divine strength. Good triumphs over evil. We face basically simple choices. Either we choose to do God’s will or not. But, it’s not often easy. There is a struggle within us because of our weakness caused by past sins. There also are many allurements around us. The devil can step up his efforts. However, just as St. Michael relied upon the power of God, we should do so as well. Then, we will win each and every time. It is important to call upon others to help us in times of temptation. We should ask our patron saints, our guardian angels, St. Michael himself and our Lady to pray for us. Evil cannot stand up to such power coming from Heaven. Our relatives and friends here on earth can help with their prayers too. Good is stronger than evil. In just one year we will celebrate our 100th anniversary as St. Michael the Archangel Church here in Lyndhurst. We are very happy about this. I believe that St. Michael has continually protected our parish and helped to keep it growing. He does the same for all of us. Let us ask him for his help and prayers so that we will continually say “yes” to God and “no” to the devil.